Join Bailey, Sammy, Trudy, and Millie in Fun Learning Adventures! This Product Uploads to Your Computer's Hard Drive and Runs Without the DVD! Develop a love of reading with Bailey! Welcome to Bailey's Book House, where learning about letters and words is a natural part of play! 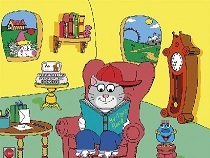 Seven interactive games encourage young learners to explore the sounds and meanings of letters, words, rhymes and stories. Engaging creative activities allow children to apply their knowledge in projects like designing greeting cards, printing booklets and creating their own Mother Goose rhymes. 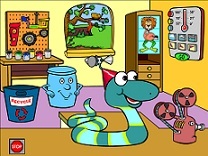 Build fundamental early math skills with Millie and friends. 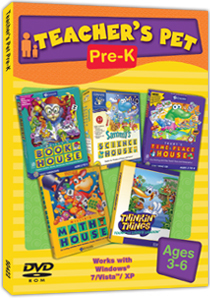 Designed by early learning experts, Millie's Math House introduces and builds fundamental early math skills while engaging young students with seven fun-filled activities. Students explore numbers, shapes, sizes, quantities, patterns, sequencing, addition, and subtraction. By counting critters, making jellybean cookies, and creating colorful caterpillars, students learn how to associate numbers with quantities, shapes with names, and much more. Explore the wonderful world of science with Sammy! Discover important science concepts on a fun-filled adventure at Sammy's Science House(r). Five irresistible activities introduce essential ideas like patterns and sorting, weather and seasons, animal habitats and classifications in the natural world. With both spoken and graphical instructions, this lively science romp nurtures independent learning in early readers and pre-readers. Explore time and geography with Trudy! 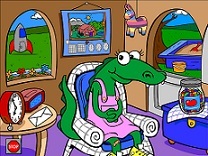 Trust Trudy to help little learners get their bearings on a host of important topics. From telling time to understanding maps to building a sense of direction, this whimsical time-and-place adventure presents challenging concepts with ageappropriate warmth and charm. Lively music, engaging interactive games, and a variety of friendly characters keep kids focused, excited and eager to learn. Early learners develop visual, spatial, logical, and essential critical-thinking skills. 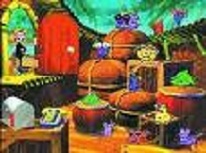 Thinkin' Things Collection 1 combines with Toony the Loon's Lagoon to present six playful activities that focus on memory development, logic, visual and spatial thinking, musical memory, and problem solving. Single Switch option increases accessibility for special needs students. Loads to the Hard Drive!